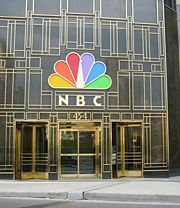 NBC (an acronym for National Broadcasting Company, its former corporate name) is an American television network headquartered in the GE Building (formerly RCA Building) in New York City's Rockefeller Center. It is sometimes referred to as the Peacock Network due to its stylized peacock logo. Formed in 1926 by Radio Corporation of America (RCA), control of NBC passed to General Electric (GE) in 1986 following GE's $6.4 billion purchase of RCA. The Peacock Network's corporate name was shrunk from "National Broadcasting Company, Inc." to "NBC Universal, Inc." following the merger with French Vivendi Universal's Entertainment division, then owner of Universal Studios, in May 2004. NBC has continued to use the full name during official and occasional broadcasts, such as its coverage of the Macy's Thanksgiving Day Parade. The television network supplies programming to more than 200 affiliated U.S. stations, and is one of the "big three" that dominated broadcasting in the United States during the twentieth century (the other two being CBS and ABC). As such, NBC has been a major force in forming the American culture of the twentieth century. The National Broadcasting Company (NBC) radio network went on the air with 24 affiliated stations on November 15, 1926. It was owned by Radio Corporation of America (RCA), itself set up in 1919 to control Guglielmo Marconi's American patents; RCA in turn was owned by the General Electric Company (GE), the Westinghouse Electric Corporation, the United Fruit Company, and American Telephone & Telegraph (AT&T). During a period of early consolidation in the broadcasting business, RCA had acquired New York radio station WEAF from AT&T. RCA shareholder Westinghouse had a competing facility in Newark, pioneer station WJZ, which also served as the originating station for a loosely structured network. This station was transferred from Westinghouse to RCA in 1923, and moved to New York. WEAF had been a laboratory for AT&T's Western Electric, which manufactured transmitters and antennas. AT&T's long-distance and local Bell operating divisions were developing technologies for transmitting voice- and music-grade audio over short and long distances, via both wireless and wired methods. Thus AT&T's creation of station WEAF in 1922 offered a research-and-development center for these activities. WEAF put together a regular schedule of programs of all types, and created some of the first broadcasts to incorporate commercial endorsements or sponsorships. It was an immediate success and WEAF created links with other stations to offer coverage of sports or political events. WEAF's first efforts in what would become known first as "chain broadcasting" and later as "networking" tied together Outlet Company's WJAR in Providence, Rhode Island with AT&T's WCAP in Washington, D.C. (named for the Chesapeake and Potomac Telephone Company division of AT&T). RCA also saw an advantage in sharing programming, and after getting a license for station WRC in Washington, D.C. in 1923, attempted to transmit audio between cities via low-quality telegraph lines (since AT&T refused outside companies access to their higher quality telephone lines). The effort was poor at best, with the uninsulated telegraph lines incapable of good audio transmission quality and very susceptible to both atmospheric and man-made electrical interference. In 1925, the management of AT&T decided that WEAF and its network was not compatible with AT&T's goal of providing a telephone service, and offered to sell the station to RCA, whose business was manufacturing radio sets. When RCA bought WEAF, it gained rights to rent AT&T's phone lines for network transmission. For $1 million, RCA acquired radio station WEAF and a Washington sister-station, WCAP, which it shut down. This transaction accompanied the announcement, in the late summer of 1926, of a new wholly-owned division of RCA called the "National Broadcasting Company. It was actually owned 50 percent by RCA, 30 percent by General Electric, and 20 percent by Westinghouse. The network officially was launched on November 15, 1926. WEAF and RCA's WJZ already were the flagship stations of two radio networks, and they operated side-by-side for about a year as part of the new NBC. In 1927, the two NBC networks formally divided their respective marketing strategies: the NBC Red Network offered entertainment and music programming; the NBC Blue Network carried many of the "sustaining" or non-sponsored broadcasts, especially news and cultural programs. Legend has it that the color designations originated from the color of the push-pins early engineers used to designate affiliates of WEAF (red pins) and WJZ (blue pins). A similar two-part/two-color strategy appeared in the recording industry, dividing the market between classical and popular offerings. At various times in the 1930s NBC developed additional color designations, with the NBC White, Gold, and Orange (hence the logo) networks operating in various configurations in the South, the Midwest, and on the West Coast. In a major move in 1931, RCA signed crucial leases with the new Rockefeller Center management that resulted in it becoming the lead tenant of what was to become in 1933 its corporate headquarters, the RCA Building, at 30 Rockefeller Plaza in Manhattan. Under the terms of the lease arrangement, this included studios for NBC and theaters for the RCA-owned RKO Pictures. The deal was arranged through the Center's founder and financier, John D. Rockefeller, Jr., with the chairman of GE, Owen D. Young, and the president of RCA, David Sarnoff. 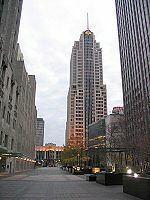 From its creation in 1934, the Federal Communications Commission (FCC) had studied the monopolistic effects of network broadcasting on the industry, and found that NBC's two networks and their owned-and-operated (O&O) stations dominated audiences, affiliates, and advertising dollars in American radio. In 1939, the FCC ordered RCA to divest itself of one of the two networks; RCA fought the divestiture order, but divided NBC into two companies in 1940 in case an appeal was lost. The Blue Network became the "NBC Blue Network, Inc.," now known as American Broadcasting Company (ABC), and the NBC Red Network became "NBC Red Network, Inc."
With the loss of the final appeal before the United States Supreme Court, RCA sold the NBC Blue Network, Inc. for $8 million to Lifesavers magnate Edward J. Noble in 1943. For his money Noble got the network name, leases on land-lines and the New York City studios, two-and-a-half stations (WJZ in Newark/New York, KGO in San Francisco, and WENR in Chicago which shared a frequency with "Prairie Farmer" station WLS) and about 60 affiliates. Noble renamed the company "The Blue Network, Inc." but wanted something more memorable. In 1944 he acquired rights to the name "American Broadcasting Company" from George Storer and the Blue Network became ABC, with the official name change announced on June 15, 1945, after the sale was completed. "NBC Red" reverted to being simply "NBC" when Blue was sold. In the golden days of network broadcasting, 1930 to 1950, NBC was the pinnacle of American radio. Home to many of the most popular stars and programs, NBC stations were often the most powerful, or occupied clear-channel frequencies so that they were heard nationwide. Such well-known stars as Al Jolson, Bob Hope, Jack Benny, Edgar Bergen, Johnny Carson, and Fred Allen called NBC home, as did Arturo Toscanini's NBC Symphony. NBC also broadcast radio's earliest hit, Amos 'n' Andy, in its original fifteen-minute serial format that set the standard for just about all serialized programming in the first radio era, whether comedies or soap operas. As television became more popular in the 1950s, many NBC radio stars gravitated there. Toscanini made ten television appearances on NBC between 1948 and 1952. In 1950, the network sanctioned The Big Show, a 90-minute radio variety show that harked back to radio's earliest musical variety style but with sophisticated comedy and dramatic presentations and featuring stage legend Tallulah Bankhead as its host. It aimed to keep classic radio alive as television matured and to challenge CBS's Sunday night lineup—much of which had jumped there from NBC in the late 1940s, especially including Jack Benny. But The Big Show's initial success did not last despite critics' praises; the show endured only two years, with NBC said to lose a million dollars on the project. NBC Radio's last major programming push, in 1955, was Monitor, a continuous, all-weekend mixture of music, news, interviews, and features with a variety of hosts including such well-known television personalities as Dave Garroway, Hugh Downs, Ed McMahon, Joe Garagiola, and Gene Rayburn. The potpourri also tried to keep vintage radio alive in featuring segments from Jim and Marian Jordan (in character as Fibber McGee and Molly), Ethel & Albert, and iconoclastic satirist Henry Morgan, among others. Monitor was a success for a number of years, but after the mid-1960s, local stations, especially in larger markets, became increasingly reluctant to break from their established formats to run non-conforming network programming. After Monitor went off the air in early 1975, there was little left of NBC Radio beyond hourly newscasts and news-related features. Later in 1975, NBC launched the NBC News and Information Service, which provided up to 55 minutes of news per hour around the clock to local stations that wanted to adopt an all-news format. The service attracted several dozen subscribers, but not enough to allow NBC to project that it would ever become profitable, and it was discontinued after two years. Near the end of the 1970s, NBC started "The Source," a modestly successful secondary network that provided news and short features to FM rock stations. After their 1986 acquisition of NBC, GE decided that the radio business did not fit their strategic objectives. NBC Radio's network operations were sold to Westwood One, and the NBC-owned stations were sold to various buyers. In 1989, the NBC Radio Network as an independent programming service ceased to exist, becoming a brand name for content produced by Westwood One. By the late 1990s NBC-branded newscasts were being produced only on weekday mornings; around 2003 even these were discontinued, and the remaining NBC Radio Network affiliates began to receive CNBC Radio-branded newscasts at all hours. At about the same time Westwood One began to distribute a new service called NBC News Radio, consisting of brief news updates read by NBC News and MSNBC anchors and reporters. 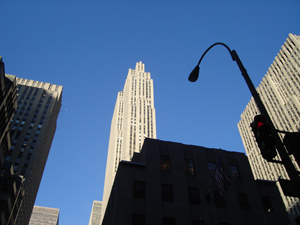 Thirty Rockefeller Center, also known as the GE Building, is the world headquarters of NBC. For many years NBC was closely identified with David Sarnoff, who used it as a vehicle to sell consumer electronics. It was Sarnoff who ruthlessly stole innovative ideas from competitors, using RCA's muscle to prevail in the courts. RCA and Sarnoff had dictated the broadcasting standards put in place by the FCC in 1938, and stole the spotlight by introducing all-electronic television to the public at the 1939-40 New York World's Fair, simultaneously initiating a regular schedule of programs on the NBC-RCA television station in New York City. President Franklin Delano Roosevelt appeared at the fair, before the NBC cameras, becoming the first U.S. president to appear on television on April 30, 1939. The broadcast was transmitted by NBC's New York television station W2XBS Channel 1 (now WNBC-TV channel 4) and was seen by about 1,000 viewers within the station's roughly 40-mile coverage area from their Empire State Building transmitter location. The next day, May 1, four models of RCA television sets went on sale to the general public in various New York City department stores, promoted in a series of splashy newspaper advertisements. It is to be noted that DuMont (and others) actually offered the first home sets in 1938 in anticipation of NBC's announced April 1939 start-up. Later in 1939, NBC took its cameras to professional football and baseball games in the New York City area, establishing many "firsts" in the history of television. Actual NBC "network" broadcasts (more than one station) began about this time with occasional special events—such as the King and Queen of England's visit to the New York World's Fair—being seen in Philadelphia (over the station which would become WPTZ, now KYW) and in Schenectady (over the station which would become WRGB), two pioneer stations in their own right. The most ambitious NBC television "network" program of this pre-war era was the telecasting of the Republican National Convention in 1940 from Philadelphia, which was fed live to New York and Schenectady. However, despite major promotion by RCA, television set sales in New York in the 1939-1940 period were disappointing, primarily due to the high cost of the sets, and the lack of compelling regular programming. Most sets were sold to bars, hotels, and other public places, where the general public viewed special sporting and news events. NBC's experimental New York City station was licensed for commercial telecasts beginning on July 1, 1941, adopting the call letters WNBT (it is now WNBC-TV). The first official commercial on that day was for Bulova watches, seen just before the start of a Brooklyn Dodgers telecast. Limited programming continued until the U.S. entered World War II. Telecasts were curtailed in the early years of the war, then expanded as NBC began to prepare for full service upon the war's end. On VE-Day, 1945, WNBT broadcast hours of news coverage, and remotes from around New York City. At one point, a WNBT camera placed atop the marquee of the Hotel Astor panned the crowd below celebrating the end of the war in Europe. It was, by all reports, a thrilling prelude of things to come as television began its rapid ascent into the American household. After the war ended, development of television soared ahead and the NBC television network grew from its initial post-war lineup of four stations. The World Series of 1947 featured two New York teams (Yankees and Dodgers) and local TV sales boomed, since the games were telecast in New York. Stations along the East coast and in the Midwest were gradually connected by coaxial cable in the 1940s until September 1951, when the first transcontinental telecasts took place. The early 1950s brought massive success for NBC in the new medium, as it launched television's first superstar in Milton Berle, whose antics on the The Texaco Star Theater drew massive audiences. Also, the network launched Today and The Tonight Show, which would bookend the broadcast day for over fifty years, continuing to this day to draw more eyes than the comparable offerings of other networks. While rivals CBS and DuMont also offered color broadcasting plans, RCA convinced a waffling FCC that its color system should prevail, and in December 1953 the FCC agreed; the NBC network was to begin offering color programming within days of the FCC's decision. NBC began broadcasting certain shows in color in 1954, and the first NBC show to air all episodes in color, The Marriage, was shown that summer. In 1956, NBC announced that their Chicago TV station—WNBQ (now WMAQ-TV), was the first color TV station in the nation (at least six hours of color broadcasts a day). In 1961 and 1962, NBC-TV offered "Color Weeks" where most of the primetime schedule would be broadcast in color. The event was marked by promotional pushes for RCA Color TV. By 1963, most of NBC's prime time schedule was in color; without television sets to sell, rival networks followed more slowly, CBS in 1965 and ABC in 1966. It was during the period of the 1970s and through the mid-1980s that NBC suffered its massive slide in the ratings. The network was beginning to lose some of its luster to other networks, particularly CBS. Fred Silverman, who had taken over NBC's programming department, had given a green light to a number of shows including the most notorious of all NBC series, Supertrain. All of these series and more did not survive a single season. Perhaps the low point was in 1983, when NBC began its new fall season with nine new series. All nine of them were eventually canceled before completing a year. This is the only time that a network's entire line of new series has failed to be renewed for a second season. Fortunately, during this period there were two bright spots: Johnny Carson's Tonight Show solidly held its enormous ratings, and was reported to be the network's top money-maker in the 1970s. Also during this time, NBC suffered through the defections of several longtime affiliates including WSB-TV in Atlanta, WBAL-TV in Baltimore, WSOC-TV in Charlotte, WRTV in Indianapolis, and KSTP-TV in Minneapolis-St. Paul. Most of the defecting stations were wooed away by ABC, which was the number-one network during the late 1970s and early 1980s; in markets such as San Diego and Jacksonville, NBC was forced to replace the lost stations with new affiliates broadcasting on the UHF band. NBC would soon rebound in the ratings, thanks to new programming chief Brandon Tartikoff. During the 1980s and 1990s, NBC programmed several hit television shows and became a leader in comedy, most notably on its self-christened "Must See TV Thursdays." Sitcoms such as Cheers, The Cosby Show, Seinfeld, and Friends, would each finish as a season's #1 show at least once and enjoy success in syndication afterwards. The network also aired several successful dramas, including Hill Street Blues, L.A. Law, and ER. It was estimated in 2003 that NBC was viewable by just over 97 percent of all households, reaching 103,624,370 viewers in the United States. NBC has 207 affiliated stations in the United States and its possessions. It is also seen throughout Latin America and the Caribbean via cable and satellite, via the WNBC-TV feed from New York City. With the loss of Friends in 2004, NBC was faced with several moderately rated shows and few true ratings hits. This, combined with CBS' popular CSI franchise, FOX's American Idol and ABC hits such as Lost, Desperate Housewives, and Grey's Anatomy, led to NBC being ranked as the fourth most watched television network in the United States. During the 2004-2005 season, NBC became the first major television network to start producing its programming in widescreen HDTV format, with the hopes of attracting new viewers. Though NBC did see a slight boost in viewers, there was no significant rise in ratings, since HDTV television was not yet popular. NBC is not shown outside the Americas on a channel in its own right. However, both NBC News and MSNBC are shown for a few hours a day on Orbit News in Europe, Africa, and the Middle East. NBC Nightly News is shown on CNBC Europe. MSNBC is also shown occasionally on sister network CNBC Europe during breaking news. In 1993, NBC began production of Canal de Noticias NBC, which holds the distinction of being the first 24-hour news service to be seen in Latin America. This service was beamed to Latin America from the NBC Newschannel headquarters located in Charlotte, North Carolina. Over 50 journalists were brought in to produce, write, anchor, and technically produce a 24-hour news service based on the popular "wheel" conceived at CNN. The service folded in 1997 as sales departments were not able to generate any revenue. Also in 1993, the Pan-European cable network Super Channel was taken over by General Electric, the parent of NBC, and became NBC Super Channel. In 1996, the channel was renamed NBC Europe, but was, from then on, almost always referred to as simply "NBC" on the air. Most of NBC Europe's prime time programming was produced in Europe, but after 11 p.m. Central European Time on weekday evenings, the channel aired The Tonight Show, Late Night with Conan O'Brien, and Saturday Night Live, hence its slogan "Where the Stars Come Out at Night." Most NBC News programs were broadcast on NBC Europe, including Dateline NBC and NBC Nightly News, which was aired live. The Today Show was also initially shown live in the afternoons, but was later broadcast the following morning instead, by which time it was more than half a day old. In 1999, NBC Europe stopped broadcasting to most of Europe. At the same time the network was relaunched as a German language computer channel, targeting a young demographic. The main show on the new NBC Europe was called GIGA. In 2005, the channel was relaunched once again, this time as a free-to-air channel under the name Das Vierte. NBC, along with the other "Big Three" networks, still maintains a large portion of television viewing audiences. It has also branched out into the Internet, offering a number of shows through streaming video via their website, along with exclusive Internet content. NBC has been party to a number of controversies. One involves the 2007 Jamie Foxx special Unpredictable. Allegations were made that NBC refused to promote the show because Foxx would not include a white performer in the special. Conservative pundit and former CBS executive Bernard Goldberg, along with the group Parents Television Council, have criticized NBC for a double standard against Christians. They claim that NBC put ratings above morality in broadcasting controversial images of the singer Madonna being mock-crucified during a performance. Other media pundits have claimed that NBC milked a controversy involving comments made by the writer Ann Coulter about widows of September 11, 2001. These critics stated that NBC condemned Coulter's comments, yet repeatedly gave her an outlet to make them. The White House of George W. Bush accused NBC's David Gregory of partisanship for his reporting over the release of recommendations made by the Iraq Study Group on the War in Iraq in 2007. MSNBC, a combination of MSN and NBC, is a 24-hour cable news channel in the United States and Canada, and a news website, founded in 1996 by Microsoft and NBC. Ten years later, MSNBC cable was America's least watched cable news channel, after Fox News and CNN, but ahead of CNN Headline News. The news station began broadcasting primarily out of its studios in Secaucus, New Jersey, but announced that it would be moved to NBC's main headquarters in New York City. The online news outlet is MSNBC.com for the NBC News family, including network shows such as Today, NBC Nightly News, and Dateline NBC as well as MSNBC TV. In addition to NBC News content and material produced by the site's own staff, MSNBC.com also hosts articles and features from several partners, including The Washington Post and Newsweek magazine. ↑ RCA Lead Tenant of Rockefeller Center—see John Ensor Harr and Peter J. Johnson. The Rockefeller Century: Three Generations of America's Greatest Family. (New York: Charles Scribner's Sons, 1988), 326. ↑ The Jamie Foxx Controversy Rachel's Tavern. Retrieved March 21, 2007. ↑ Ratings at Root of NBC's Anti-Christian 'Madonna' Broadcast, Says Critic GOPUSA. Retrieved March 21, 2007. ↑ NBC still disapproves of—still milking controversy over—Coulter comments Media Matters. Retrieved March 21, 2007. ↑ NBC's David Gregory accused of partisanship for confronting White House with ISG findings Media Matters. Retrieved March 21, 2007. ↑  Inside Cable News blog, January 31, 2006. Retrieved May 23, 2007. ↑ Scott Collins. Crazy Like a Fox: The Inside Story of How Fox News Beat CNN (Portfolio Hardcover, 2004. ISBN 1591840295). ↑ Alex Johnson, Oct. 25, 2006.Job losses, big changes coming at NBC Newsmsmbc. Retrieved April 12, 2007. History of "National Broadcasting Company"
This page was last modified on 8 November 2018, at 17:39.